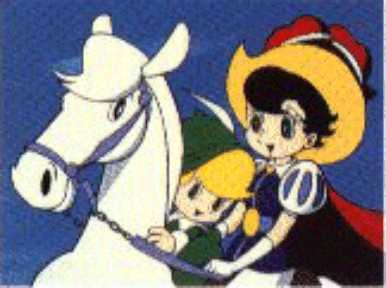 The story as I've been able to put together is that the series Princess Knight was licensed and dubbed by Joe Oriolo at Oriolo Film Studios initially for the U.S. market in 1971. 52 English episodes scripts were written and the lines dubbed. Unfortunately, the business arrangement between Joe Oriolo and his then partner, Burt Hecht, fell apart, and as part of the settlement, the Hecht departed with the "Princess Knight" masters never to be heard from again. For over 20 years anime historians were unable to confirm whether Hecht or subsequent owners of the property ever got it into any of the U.S. markets. This is why most people have never seen it, or know of its existence. The series, however, was marketed to other English speaking countries where it ran in syndication for years as it did in Australia beginning in November of 1972 at 4:30pm on channel 7. It has been recently established that Princess Knight did indeed play in select U.S. markets in the 1970s. It showed up in Hawaii in the early 1970s, in Texas in the mid 1970s, and the Minneapolis/St.Paul area first in 1978 and again in 1982-1983 on KSTP-TV, Channel 5. Other information that it may have run on Nickelodeon many years back as a part of a retro/nostalgia marathon, but this has yet to be confirmed. An interesting note: Before the split between Joe Oriolo and Bert Hecht, Joe's son, Don Oriolo, and a fellow named Roger Grod, managed to edit several of the episodes together for a theatrical release, giving it the title "Choppy and the Princess". Don managed to get it into a few cinemas, but it didn't do too well. It also had a weak video release. We also know that it was released on home video in both the U.K. and in Australia in the early 90's. In 1996, the Princess Knight masters minus the opening and closing credits turn up in the hands of some company in the Netherlands. Streamline Pictures in California got the masters and was busy negotiating with Orion for the distribution when the deal fell through. Orion was in financial trouble at the time and has since been bought-out by MGM. Now, MGM holds the "Prince Planet" and "Johnny Sokko and His Flying Robot" masters which had been in the Orion library. As for Princess Knight, the masters are back with the folks in The Netherlands and Shawne Kleckner at The Right Stuf (a company committed to rescuing classic anime from oblivion) is trying to negotiate for the series release. The above description came from Andrew Paul Shepherd, and was edited by yours truly (contact me). The king and the queen have a daughter, and the queen can't have more children. Since only a boy can be king, she is disguised and trained as such. Enemies in the court, such as Neelon, spy her every move, and there is a Duke that always caused problems as well. A little angel, Choppy, is her companion as she goes through a total of 54 (?) episodes, meeting such characters as a very mean and powerful sorcerer and his daughter, who becomes her best friend. In the last episodes, her parents are killed by a powerful invader, and she has to retake the kingdom with the help of her few remaining friends, after which her parents are given back to her. I forgot to mention that she sometimes acts under the disguise of the Phantom Knight -- or something like that, I saw the series in French -- and the young prince of the neighboring kingdom marries (or gets engaged to) her when he finds out that she's a girl, therefore providing for a happy ending. All in all, a wonderful series that I would LOVE to see on DVD someday. The above description came from Thierry, and was edited by yours truly (contact me). The story at the start shows babies in heaven ready to be given a heart, which will decide whether they will be male or female (pink for girl blue for boy). The angel kid was mischievous and changed the princess' heart from a blue one to a pink one, hence she is born a girl. The angel was then sent to retrieve her soul and give her the right one. Also, as the story progresses the king is deposed (I am not sure why or how, I think it was a invasion) and the Queen and the princess are sent into prison. The Princess finds a way out of the prison and begins to fight for justice in the surrounding countryside (a la Robin Hood, Zorro) as the Phantom Knight. The above description came from Kero and Michael Marciel, and was edited by yours truly (contact me). A message from Lazar West, who used to watch Princess Knight religiously on Sky-Channel in Switzerland, tells us that the basics of the show involved a princess who would dress up in disguise as a lad to fight bad guys, while trying to keep her identity a secret. According to a message from Reece, he lived in Hawaii during the early 70's, where they showed a lot of anime and live-action Japanese shows. Because of this, Reece has been able to confirm that Princess Knight also aired in Hawaii, on KIKU television, between Kikaida and Kamen Raida (two popular, live-action sci-fi Japanese shows). Someone else noted that they watched it in the early 1970s on KGMB-TV, Honolulu as part of an afterschool children's show called Checkers & Pogo . An email from Al says that he can also verify that Princess Knight aired in the US, both in Hawaii (from 1970-73) and Sunday mornings in Texas (mid 1970's). Then Anthony says that he distinctly recalls watching it as early as the late 1970s and as late as 1983 to 1985 on Iowa Public Television. Dustin confirms that it was airing around 1982-1983 where he watched it early Saturday mornings in Minnesota (near Minneapolis). Some info sent by Adam sheds some new light on the story of Princess Knight. He says that her father is king of their country, and the law only allows men to take the throne. The Queen either died or is unable to have more children, so they must hide the fact that she is a girl. She had some sort of companion/guardian named Choppy (a little angel I think) to help keep her out of trouble.